When Leon Panetta resigned as CIA director and became became defense secretary in 2011, Deputy Director Michael Morell stepped in temporarily to lead the Langley, Va.-based agency. Morell initially became deputy director in May 2010 after stints as associate deputy director and director of intelligence before that. He led the agency over the summer until David Petraeus was officially sworn in as agency head in September 2011, moving back into the agency’s number two post. Friday, Morell became acting director once more upon Petraeus’ resignation, representing another turn in Morell’s 32-year career at the agency. “President Obama has asked me once again to serve as acting director, and I am deeply honored to do so,” Morell said in a statement. In an article for The Daily Beast, Kevin Fallon writes that morell has been a key behind-the-scenes figure in the U.S. war on terrorism against al Qaeda. Fallon’s piece singles out three events in that timeframe: he guessed al Qaeda as the responsible party in the Sept. 11, 2001 attacks without having seen any intelligence, insisted on due diligence prior to the raid on Osama bin Laden’s compound and ran presidential briefings during parts of the Clinton and George W. Bush administrations. None of that would have happened had he elected to go to graduate school and getting a doctorate in economics and teaching, as he originally planned to do in 1980 after earning his B.A. in economics from the University of Akron. He told the Akron Beacon Journal in 2006 he sent a resume to the CIA after graduation upon the suggestion of a friend, joining the agency as an economic analyst. 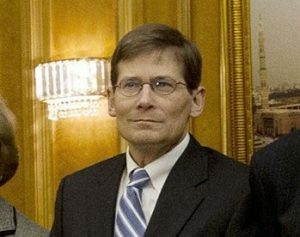 Morell also was an analyst and manager of East Asia intelligence for 14 years, then elevated in 1999 to lead the agency’s office of Asian, Pacific and Latin American analysis. Fallon writes he moved on to an undisclosed agency assignment between 2003 and 2006, then became deputy director for intelligence at the National Counterterrorism Center. Three months later, he moved back to Langley as associate deputy director, serving in the agency’s third-highest position for two years, then moved into the director for intelligence post in 2008 before elevating to deputy director. The CIA says that as intelligence director, Morell was responsible for guiding the agency’s analytic arm, which produces strategic and tactical assessments for U.S. policymakers and military commanders. George Tenet, whom Morell worked for as an executive assistant, took a similar track to the CIA’s leadership post by becoming deputy director in July 1995 and acting director in 1996. Tenet assumed the director’s role full-time in 1997.